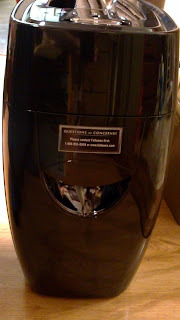 Hope's Cafe: Spring Cleaning with Fellowes Shredder- Review and Giveaway!! Spring Cleaning with Fellowes Shredder- Review and Giveaway!! With spring cleaning in full swing, I'm sure-if you're anything like me-that you have stacks upon stacks of paperwork that needs disposed of in a safe manner. Well, Fellowes is here to help! I was sent the P-12C Shredder for review, and it is a very handy tool for organizing around the house, by making sure all personal and confidential papers are taken are of properly. The Fellowes P-12C Shredder shreds documents into nearly 400 particles, with a cross-cut technology. One of my favorite features (especially with children in the house) is the SafeSense, which automatically shuts off the shredder when hands get too close! This gives extra peace of mind with the young ones around. The machine works great, and is the perfect tool to safely dispose of personal information documents. Bank statements, or anything that could contribute to identity theft-this is the perfect way to stay safe! The P-12C Shredder features a 4-gallon bin that pulls out for easy disposal. It shreds everything from simple paper (up to 12 sheets at a time) to credit cards, paper clips and staples! Freshen Up: Get rid of dust and germs that easily build up on office equipment such as keyboards, telephones and cabinets. You’ll feel instantly more productive with a clean workspace." One of my readers will win a Fellowes P-12C Shredder!! Go to Fellowes and tell me another product you could use in your home! 1 entry-Sign up for the Fellowes email newsletter! 1 entry-"Like" Fellowes on Facebook; tell them a product you'd like to try, and that you came from Hope's Cafe! This giveaway ends Tuesday, April 13, 2011, at 11:59 p.m. Please leave a valid email address in each comment, as this is how the winner will be notified. Winner will have 48 hours to respond, or another winner will be chosen. Giveaway open to US residents only. Disclaimer: I was not monetarily compensated in any way for this post. All thoughts and opinions are mine. All quotes taken from the Fellowes website. I really need some storage boxes, I would choose their Earth series boxes. entered for Vaultz cd wallet. commented on eyeglasses review post. commented on karate uniform review. the wire binding machine would be so helpful during our future homeschooling years! left a comment on the miche bag review! left a comment on the barbar digital flat iron review! I would like the Mars 95 Laminator. CRC: 52174. Thanks for a great giveaway! I signed up for the Fellowes email newsletter. Thanks! I could really use some good quality laminating sheets. Thanks for the review and giveaway chance. I like the wire binding machine. Sign up for the Fellowes email newsletter!